It was great to speak recently with Steven Sonsino. 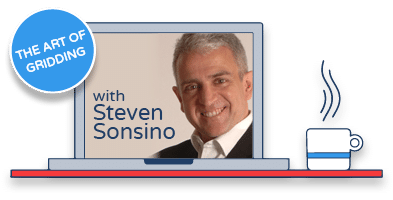 Steven is a classic polymath: a best-selling author (eleven books published), a leadership expert and a visiting professor at five business schools worldwide (including the London Business School). When we were recently introduced to each other, it was easy to see why – he has an infectious enthusiasm and passion for the many projects he is engaged in; he was a real joy to speak to. Method Grid had been introduced to him, by an existing user, in the context of a unique service he offers to aspirant business book authors. Along with his partner, Jacqueline Moore, authors.fm is a unique community-offering for anyone who is drawn to ” … make a difference by creating art and writing their story in a book for people to share and learn from”. I wish I had known about this service when I set out to write my business guides some years ago! Along with regular podcasts and blogs, Steven and Jacqueline offer a retained-fee service to guide their clients through the (often daunting) process of conceiving, planning, writing, publishing and marketing your first business book. Why was Method Grid relevant? Well, Steven has generated a wealth of expertise and intellectual property with respect to the book authoring process but, hitherto, was only able to capture this in a flat-file aide memoire. After seeing Method Grid, he was “blown away” by the ability to really bring his deep methodology to life – in a way that could expedite the process of writing a book and also contain all of his tips, tools and resources (as an invaluable in-the-moment teaching support for his clients). In this podcast, Steven talks about how the process of translating his existing IP into Method Grid really forced them to re-appraise his teaching system and how the “richness of the Method Grid platform …” has really helped them improve this set of resources “… beyond measure …” resulting in a time-saving construct for his end-clients. This podcast will be of interest to all experts who seek to position their professional services into a retained coaching type service. For Steven, Method Grid is now serving as the perfect home for the distribution of his detailed methodology and training resources. Now, a client signing up to the authors.fm service will be set up on their own Method Grid domain (with Steven and Jacqueline’s IP embedded within). As such, the How to write a business book grid is helping Steven position his manifest expertise pre-sale and then, post sale, is serving as a tangible value-point for end-clients as part of this retained service/coaching proposition. At the very least, maybe a prompt to think about how you might further capture your own deep expertise? Or, a prompt to scratch that book-in-you itch!